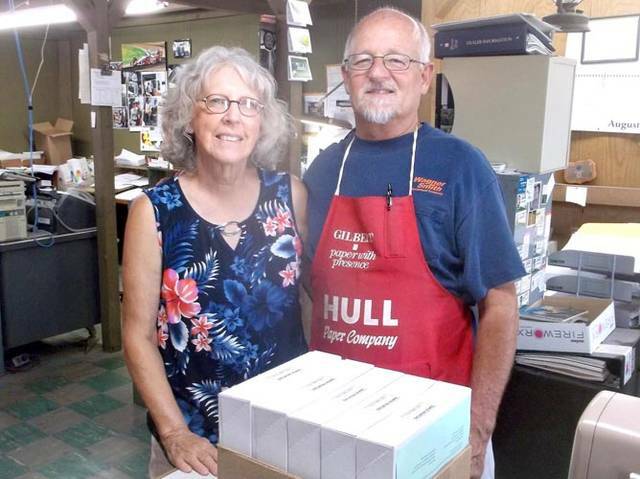 Empowering Darke County Youth Assistant Program Coordinator Kay Sloat poses with Bob Claudy, owner of Rapid Printing, while picking up this year’s Empowering After School Program signup sheets. GREENVILLE – Empowering Darke County Youth thanked Bob Claudy, owner of Rapid Printing, for his years of support for the county’s youth. Robinson added that Claudy’s service to young people didn’t start with the Empowering programs. Robinson said this year the after school program signup forms are on colored stock to make them stand out for parents. Colored stock is more expensive. No problem. Claudy had them ready in a couple of hours. No charge. Empowering will enroll students at Greenville Elementary and Middle School for its third after school program. Since 2016 the organization has provided almost 7,700 contact hours of tutoring and support to 339 students. The Empowering Mission: Empowering Darke County Youth is a United Way partner agency, providing after school and summer tutoring programs to assist students in the areas of language arts and math with the goal of strong students for a strong community.